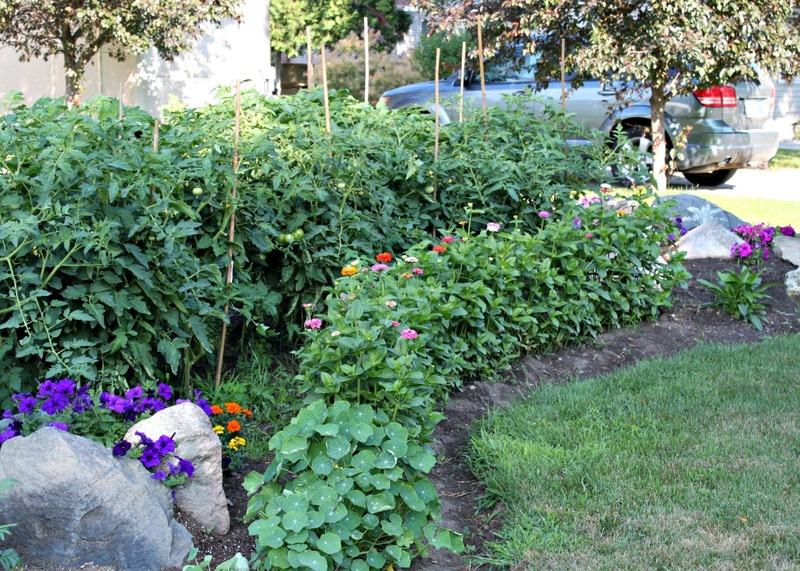 I've always been fascinated with 'front yard vegetable gardening'. 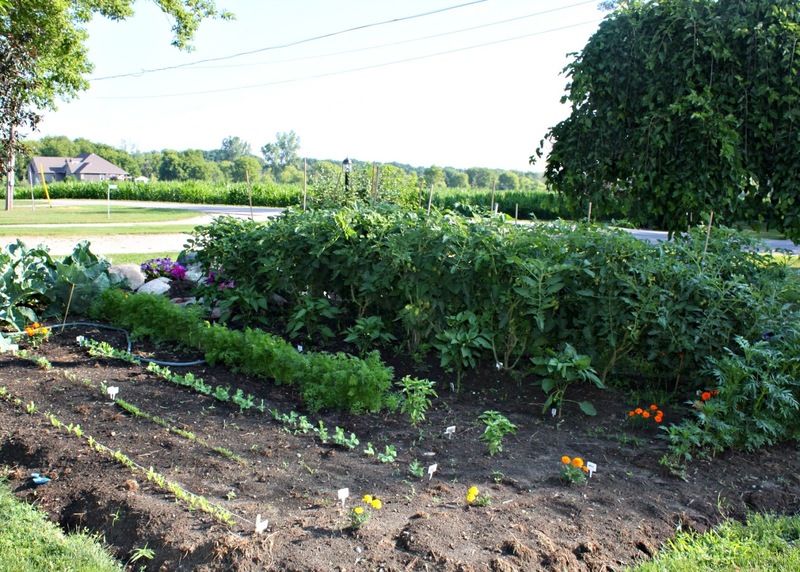 I've seen front yard vegetable gardens in urban areas and have always thought it is such a good use of space. When we moved into our home just over a year ago, there was a large perennial garden in the front yard. I tried my best to keep the weeds at bay, but it was hard to do, since everything was so overgrown and I didn't really know what plants were what, or what should be where. It seemed to have been neglected for a while and nothing I did, seemed to make it look like anything but an old overgrown perennial bed. I didn't have the same vision for it that the previous owners did. Since our house is on the river, the traditional 'back yard' is actually treated more like a front yard in our neighbourhood. Most homes have their sheds in the front yard and put little effort into the landscaping of the front yard. You live on the river and put your efforts there. 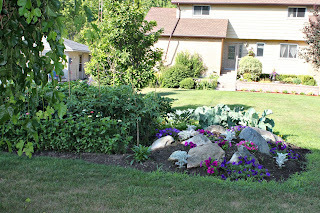 So, we decided that changing this perennial bed to a vegetable garden would be our best bet. There is too much shade to have a true vegetable garden behind the house. 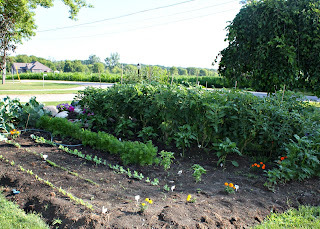 With the help of my dad, we started transforming the perennial garden into a vegetable garden. 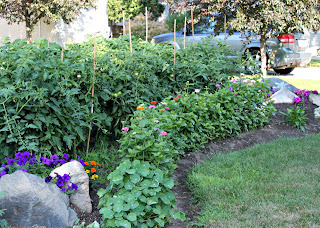 We did it in stages, so there are portions of the garden that were only planted two weeks ago. Because I have the vision of what I want our front yard vegetable garden to look like, I know where there should be no weeds. This means I spend a lot of time trying to keep those weeds at bay. It has been so theraputic to spend time weeding. Who knew, that this dreaded chore would bring such peace to me. Last night I was pulling those stubborn weeds out, thinking about the 'weeds' that are in my life. What are the things that keep creeping up, threatening to take over the beauty and potential bounty in my life? What do I need to 'weed out'? Hmmm...seems like the garden of my heart has some thorns that need weeding out. Are there weeds in this passage that stand out to you? Thorns that need weeding out so that abundant joy, peace, hope, and love can be a crop produced through you? Hope your 'gardening' brings about much fruitfulness.